Halloween is about cards, Jack 0' Lanterns, ghost, witches and black cats. We celebrate Halloween every October 31st. It is fun to watch all the children in costume come to our door. I like sending out Halloween cards to my friends on this special day. The first Halloween card was made in 1908 in America. But these cards were not too popular until the 1930s came along. The tradition of Halloween dates back for centuries, tracing back to the Celtic festival Samhain and the acknowledged of the end of the harvest season. Ever wonder where the tradition of craving the pumpkin came from? A carved pumpkin is called a Jack o’ lantern. This is a tradition of the Halloween holiday. 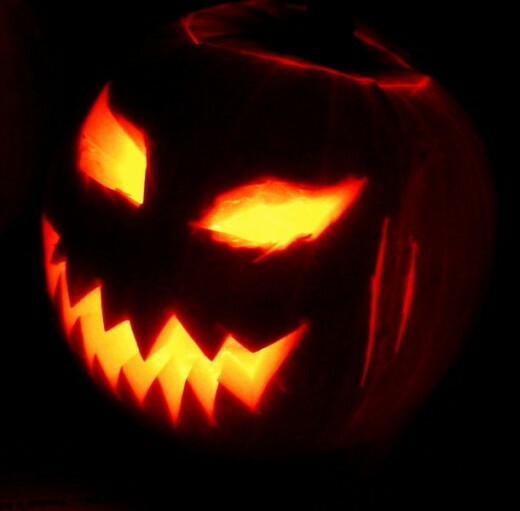 For a Jack o’ lantern, one would carve a scary or happy face out of the pumpkin. 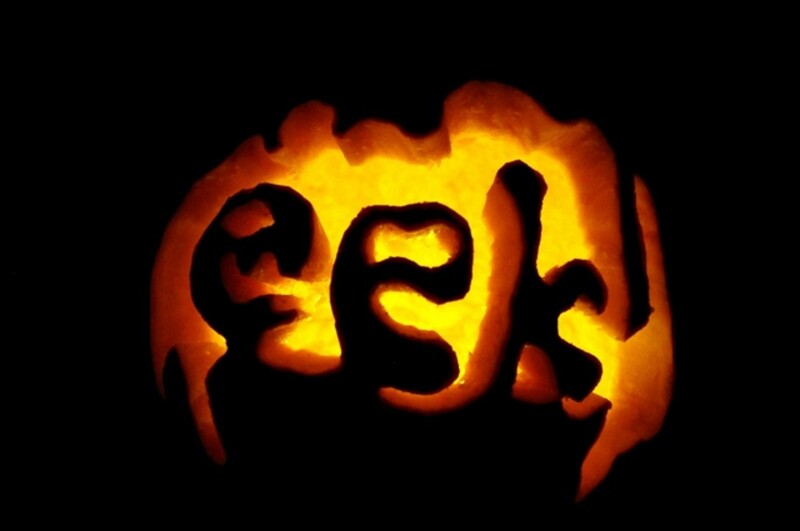 A lit candle is on the inside of the pumpkin. This gives an eerie glow to show off the face artwork. More modern times have become more creative with not only a face on the pumpkin, but just about anything imaginable. Before creating a carved out face, this squash has to go through preparations. Cut the top off. Clean out the guts of the squash. Once it is hollow on the inside, then cut out that creepy griming face or the masterpiece of something else. Add a candle or a battery operated candle. In the dark it will have that special glow. To get back to the tradition of craving the pumpkin, it is believed that it had begun in the early 19th century. 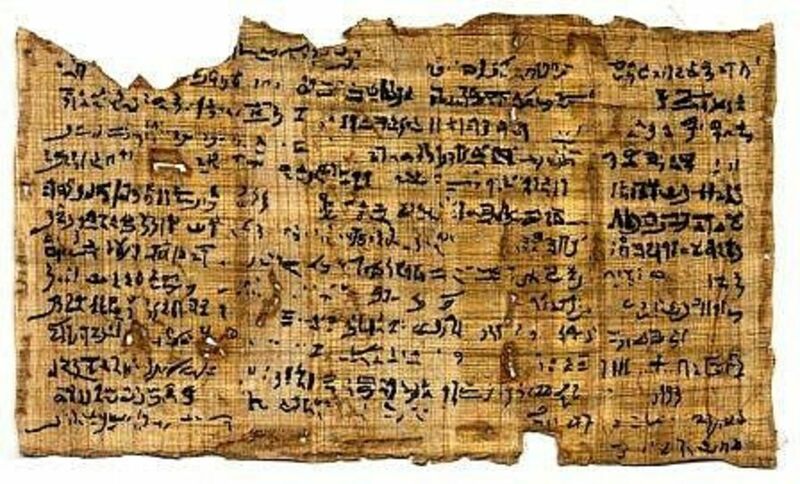 The Dublin Penny Journal had a lengthy article of the legend of "Jack-o'-the-Lantern". It is the tradition that began in Ireland and ScottishHighlands with carving the goriest of images out on vegetables. The beliefs were that the Jack o’ lanterns represented the spirits of the descended. These souls roamed the earth during the Halloween hours. The eerie glow of the Jack o’ lanterns helped ward off the evil spirits and protected the families. In folklore, it is believed that the black cat has supernatural powers. Sometimes these powers of the cat were used for the good. Good luck would follow those who came across a black cat. On the other hand, the cat resembled black magic or negative powers. Then coming across a black cat would bring bad luck. 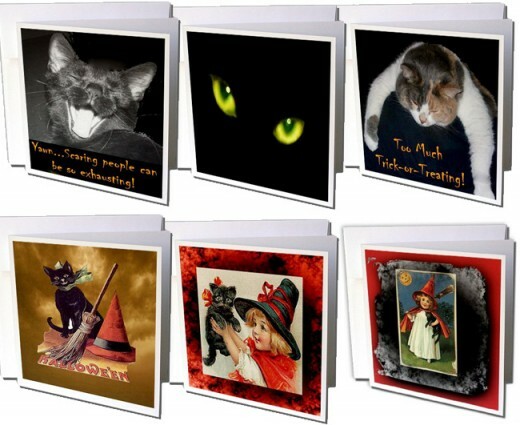 Below are six Halloween greeting cards by Sandy Mertens on 3DRose and may also be found on Amazon. These are modern and vintage card designs. The vintage are from artwork dating back to the early 1900’s. Often in superstition beliefs of witches, a black cat was the faithful companion. 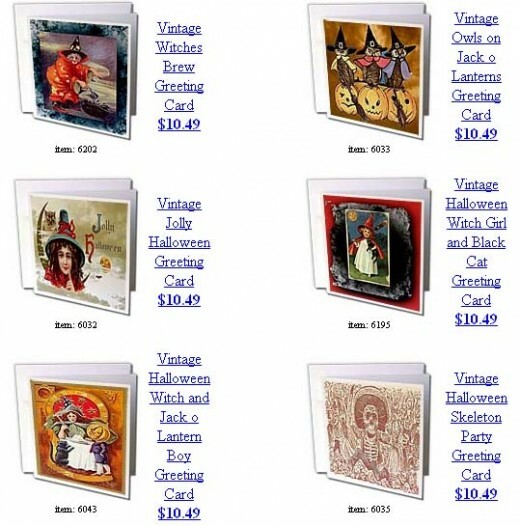 Presently there are 570 modern and vintage Halloween cards featured on Amazon by Sandy Mertens. Many more of these cards are on 3DRose. This dot com website has many designer/artistes showcasing their designs on various “print on demand” POD products. Unlike Zazzle and other custom product websites, finding artistes products is a little more complicated. If looking for Sandy Mertens products, one has to click on the product. In this case it would be “Greeting Card” on the left-hand site of the 3DRose homepage. 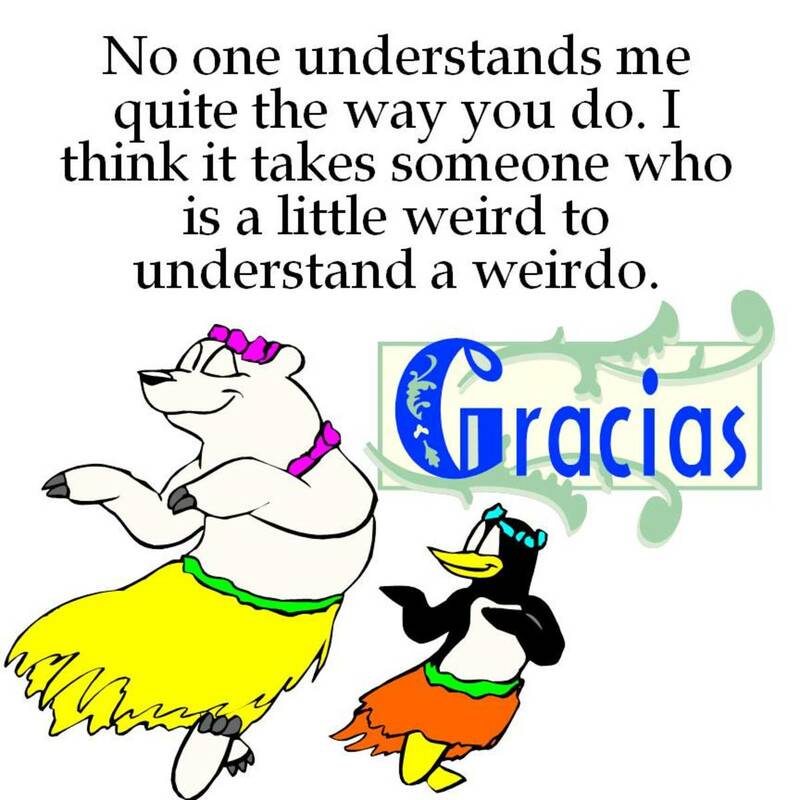 Once that is open, then you would scroll down the page that has “Greeting Card Index” until you find the categories that state “Sandy Mertens”. (Considerably far down the page because it is in alphabet order). Pumpkins, wheat and scarecrows are symbols for Halloween. These represent the harvest crops of agriculture. Later on witches, ghost, children bobbing for apples and more Halloween theme cards developed. The Irish brought trick-or-treating and jack-o-lanterns America in the 1840s, escaping the Great Potato Famine. On Halloween, Irish peasants begged the rich for food and played practical jokes on those who refused. In order for the wealthy not to be tricked, they handed out cookies, candies, and fruit. This practice continues today with children going door to door begging for candy. An old Irish tale about a man named Stingy Jack .Unable to enter Heaven because of his stingy ways and turned away by the Devil, Stingy Jack wandered the world, searching for a resting place. To light his way, Stingy Jack used a burning coal in a hollowed out turnip. When the turnip story reached America, it turned into a pumpkin. Carving out this pumpkin or turnip is called "jack-o-lantern" from this tale. Witch means wise one. It comes from the Saxon word wica. Witches were thought to be wise enough to tell the future. Orange and black became Halloween colors because of orange is associated with harvests and black is associated with death. 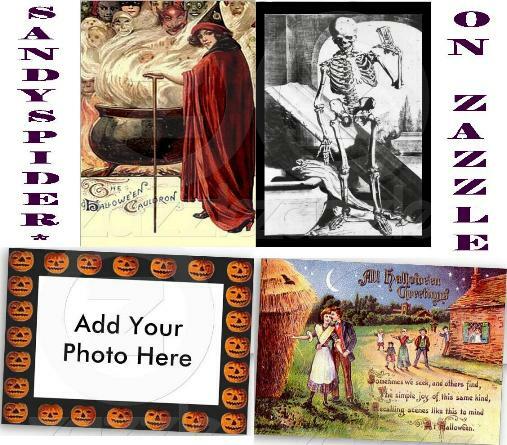 Find these same Modern and Vintage Halloween cards plus a whole lot more not found on the Amazon cards at Sandyspider Gifts on Zazzle. Look for "Halloween Vintage" and "This is Halloween" product lines. Above are only two of the several category pages. Those are listed here but without links. You can search 3DRose for those pages. Halloween, Old age, Memory Loss, Being Stupid and more. Consider adding products listed under Sandy Mertens on Amazon to your Amazon modules, articles, blogs and websites. Find Sandy Mertens under the individual products in 3drose.com, near the bottom of each product page. Near complete list of products to add to your page listed under Sandy Mertens on Amazon are: Aprons, Caps, Coasters, Coffee Gift Basket, Desk Clock, Framed Tile, Greeting Cards, Iron On Heat Transfers, Key Chains, Light Switch Covers, Mouse Pads, Mugs, Ornaments, Porcelain Plates, Quilt Squares, Sweatshirts, Napkin Holders, Pen Holders, Tiles, Tote Bags, Trivets, T-Shirts, Wall Clocks, and Water Bottles. 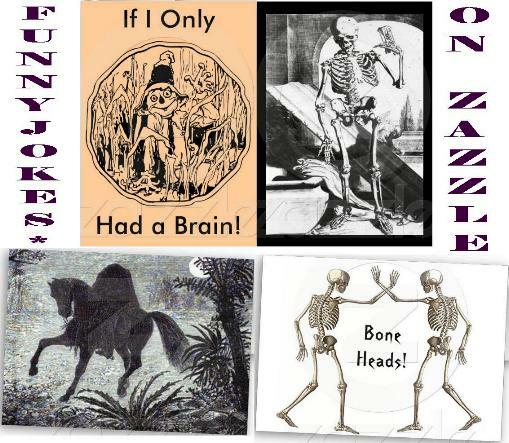 Add any products from Sandyspider Gifts and Funnyjokes Gifts on Zazzle as an affiliate on Zazzle to your site and make money if someone buys off that link. Find these links here above on this page. Is Halloween Your Favorite Holiday? Mobatia I haven't heard of Dewdrops. Interesting SandySpider,I did not know that my starving Irish ancestors had started this holiday in the sense we see today. I especially like your pumpkin cards. Great ideas. My kids used to absolutely love getting Halloween cards from my mom - it was one of those things that she did for every holiday and still does most often. My one son claims it is a Hallmark plot to get us to spend money which is too hilarious - but they certainly did enjoy receiving these every year as a kid. I actually love getting cards as well and I'm no spring chicken! Hey your big jack-o-lantern picture at the top looks like my avatar. Nice hub Sandy. Thanks for the visit mulberry1 and katiem2. WOW who knew you could get such cool and quality Halloween Cards. Thanks for the great selection of cards. Interesting history lesson. I had never heard of Stingy Jack. Love the vintage Halloween cards. CMHypno, I believe there is a cards somewhere for everything. Coolmon2009, glad you enjoyed it.